Our entire kitchen is up for replacement later this year - as soon as I work out what I want and how to make it fit the space and the budget. In the meantime, being a "stay at home mum" (bwahaha) I've been cooking more than usual and the current arrangement has been driving me nuts. We have two pantries. Big, floor to ceiling deals. One is square; the other a corner unit. Both are an incredible waste of space and not appearing in the new design. The square unit has 5 shelves. The shelves are about 16 inches apart and about 25 inches deep and wide. 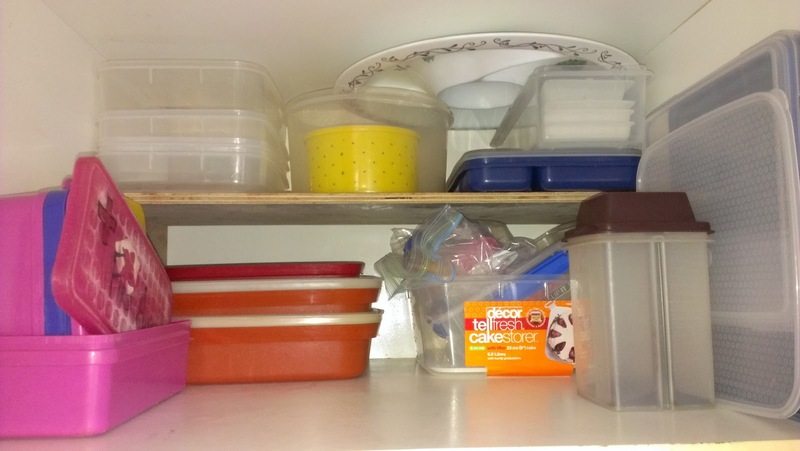 We use the unit for storing cooking equipment - baking pans, saucepans, bowls, tupperware, that sort of thing. Believe it or not, if you start stacking any of that stuff 16 inches high it becomes nigh on impossible to get at anything. As I was staring at the space last Sunday I decided what I needed was half shelf in each space. I wanted a shelf that was the full width of the cabinet, about half the depth and half the height. 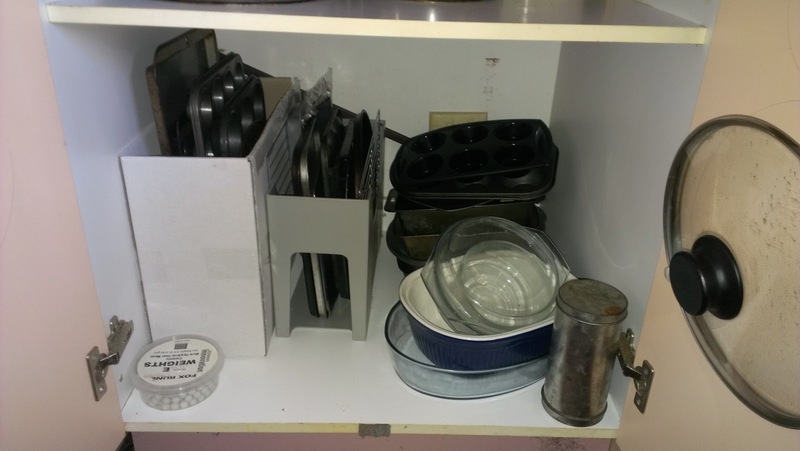 However, the worst offender was the bottom shelf, with all the baking pans. The vast majority of my baking equipment is flat. 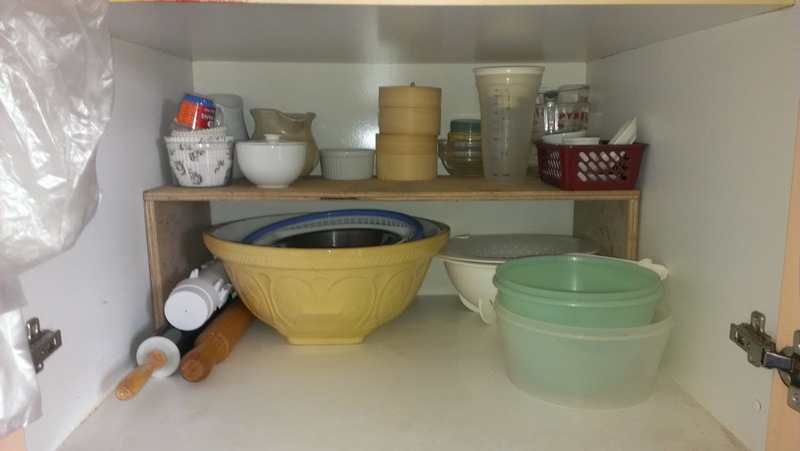 Over the years I've tried a variety of options - dish drainers, plate racks, etc to try and keep the stuff standing upright. So far nothing has worked. This is the "after" of the baking pans. 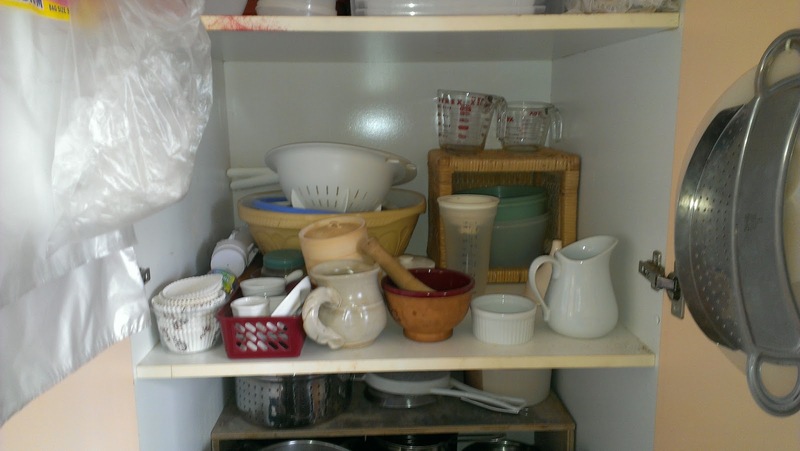 I don't have a before, but imagine a pick-up-sticks stack of pans and trays. Back to my half-shelves. Perfectionist Dan, my husband, and Fussy Phil, our handy-man neighbour, will have conniptions when they see them, but I'm happy with them. On Sunday, as I was ferreting through the workshop looking for suitable bits of wood, Phil offered to make me shelves from melamine, so 'they looked nice', rah-rah-rah. When I mentioned it to hubby, he nodded and said, yes he could knock me up something later. I like things done the day before I think of them, so today I decided I would "just do it". And it took me about an hour! It's not perfect. According to others, it may not even be finished - but it worked. 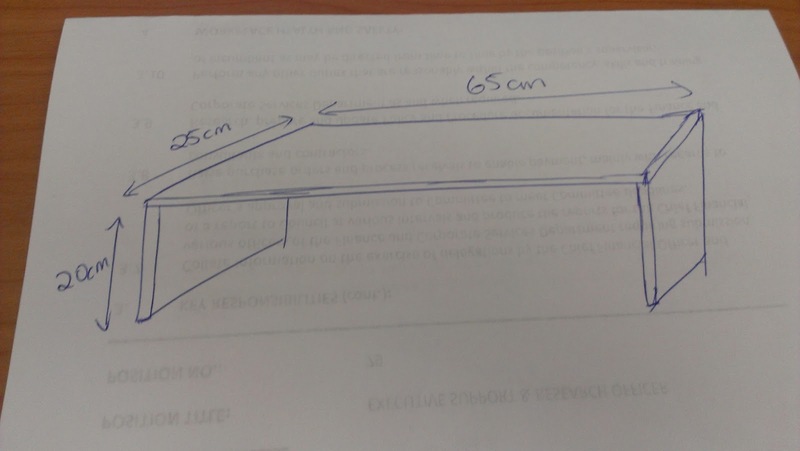 I cut out three shelves, and six 'legs'. I made the shelves the full width of the pantry. I figure if the legs are supported against the side walls it makes the whole structure more sound. I nailed the legs to the new shelf. No glue, no screws, no fuss. Like I said - I just wanted it done and when the kitchen is replaced they will be relegated to the scrap heap. This is the "after" for the shelf above. Now, I can get my mixing bowls without knocking half the contents on the floor. A couple of things were removed from this shelf, but not many. 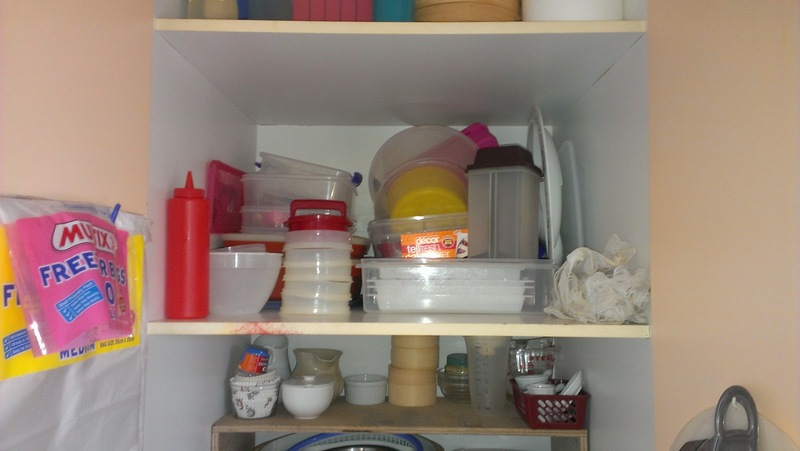 One of the most common suggestion I make to people with unwieldy cabinets and closets is to add some shelves. So it was fun to see you'd done exactly that!